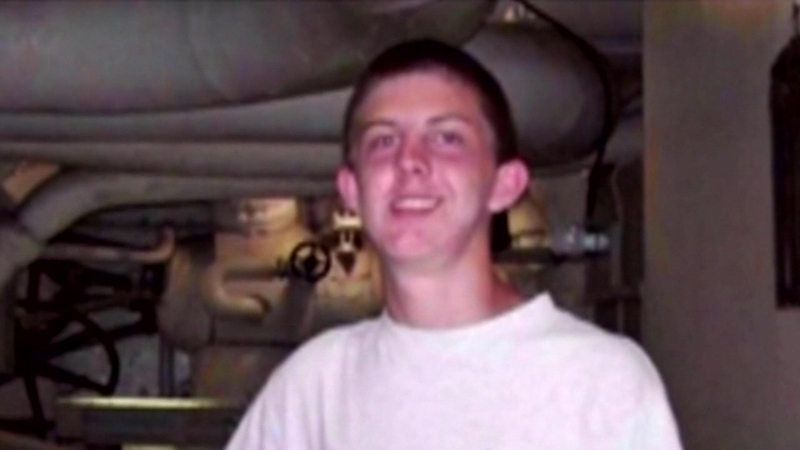 Zachary Hammond is seen in this undated file photo. COLUMBIA, S.C. -- No criminal charges will be filed in South Carolina against a police officer who fatally shot a 19-year-old during a drug sting, a state prosecutor announced Tuesday, but the U.S. Justice Department is still investigating and could bring federal charges later. Solicitor Chrissy Adams announced that after reviewing the case, she determined that Seneca police Lt. Mark Tiller won't face state charges. She made the announcement after meeting with the family of Zachary Hammond, who was killed in the July 26 confrontation in a fast-food restaurant parking lot. Dashcam video, when viewed at full speed, is troublesome, but the investigation shows Tiller broke no state laws, Adams wrote in an eight-page letter to the State Law Enforcement Agency. She noted Tiller was forced to decide in less than three seconds whether to fire his gun. The evidence "corroborates and supports Lt. Tiller's belief that he was going to be run over," she wrote in the letter, released Tuesday by the state agency as part of the case file. Ronald Richter Jr., an attorney for Hammond's family, said the family respects Adams' work, but "we completely disagree with the decision not to go forward." At the meeting, the family and attorneys for the first time saw the dashcam video of the shooting, Richter said. "It was very painful for them to watch that, but for the first time they have a better understanding of what took place," he told The Associated Press. The dashcam video, also released by the state law enforcement agency, shows the police cruiser speeding to the parking lot and pulling up behind a silver sedan. "Hands up! Put 'em up!" Tiller yells as he approaches the car. The car backs up and then starts pulling away. Tiller grabs the left front fender of the car as it moves by, at which point he fires at the driver. The car moves out of camera view, but the audio later picks up the sounds of crying and an officer telling someone to again put their hands up. A lawsuit filed by Hammond's family claims the teen had taken a woman on a first date before the shooting, then stopped at Hardee's so he could get a hamburger. Adams said the facts don't support such claims. Adams said most of the 842 pages of text messages collected from Hammond's phone dealt with drug sales, including a history of him supplying the woman, his passenger, with drugs. The texts also indicated an aggressive attitude toward police, including messages of him being "in full outlaw mode" and saying he'd "go out shootin." Hammond, who had "Outlaw" tattooed on his arm a month before his death, also texted about running through police checkpoints on several occasions, including when his mother or brother were in the vehicle. He was evading arrest on an outstanding warrant at the time, for failure to appear in court, and said in text messages he had no intention of stopping for law enforcement or going to jail, Adams wrote. "Hammond had been on a dangerous and destructive course for a significant period of his life," she said. Seneca police said an undercover officer was at the Hardee's after arranging a drug deal with the woman. The woman was not injured and later was charged with simple possession of marijuana. Cocaine packaged for distribution was found in Hammond's shorts pocket, and packaged marijuana was found near his seat, Adams wrote. Adams said Tiller should have stayed behind his car door when ordering Hammond to stop his car, but a potential policy violation "does not amount to criminal responsibility." Greg Dietterick, the city administrator for Seneca, said in a statement Tuesday that the investigation "shows Lt. Tiller was acting in self-defense. It is now time to start healing Seneca." The community of 8,200 is in upstate South Carolina, a few miles west of Clemson. Tiller attorney John Mussetto said the officer agrees with the outcome of the investigation. "As stated from day one, Lt. Tiller acted in self-defense and the decision today supports this position," Mussetto said. The lawsuit by Hammond's family says that after paramedics determined Hammond was dead, his body was left for 90 minutes on the ground, where it was bitten and stung by ants. A second officer gave the body a high-five sometime after other investigators arrived, according to the lawsuit. But the video released Tuesday does not show what happened after the shooting, nor can you see the body or hear any threat yelled. Adams said no such high-five occurred, even though a Spartanburg Department of Public Safety officer likely did make the claim. That officer was assigned to the perimeter of the scene and never came in contact with the body. He has since resigned, according to Adams' report.